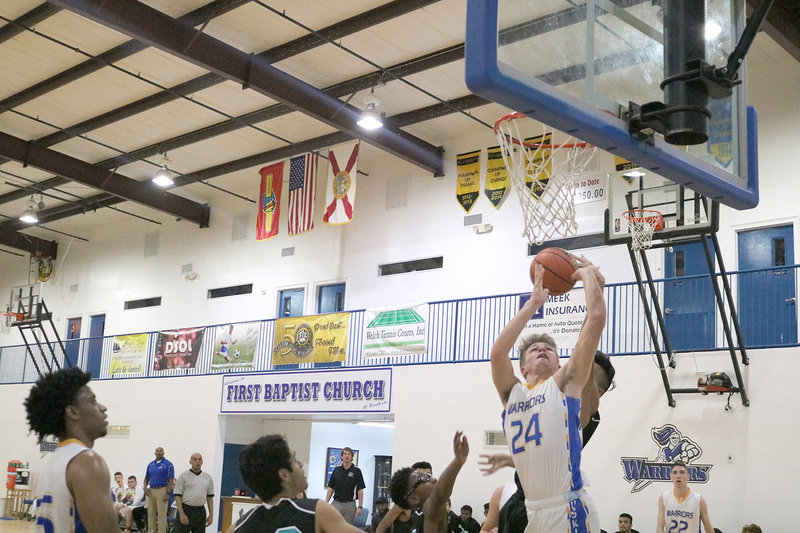 RUSKIN — Ruskin Christian School (RCS) hosts a Sarasota team Jan. 17 and then goes to Brandon Jan. 22 for upcoming games after going 2-1 in exciting boys basketball contests last week. Presently sitting at 8-3 overall and 5-2 in Florida Christian-Western League, Coach Micah Bonner’s Warriors host Palm Grove Christian this Thursday night at 6 p.m. at the RCS gym. Then they hit the road to play Central Baptist Christian at 7 p.m. next week on Tuesday. Homecoming is set for Jan. 25. The RCS Warriors’ boys are tied with Central for second place in their league play. Grace Christian is undefeated in league play and in first place. 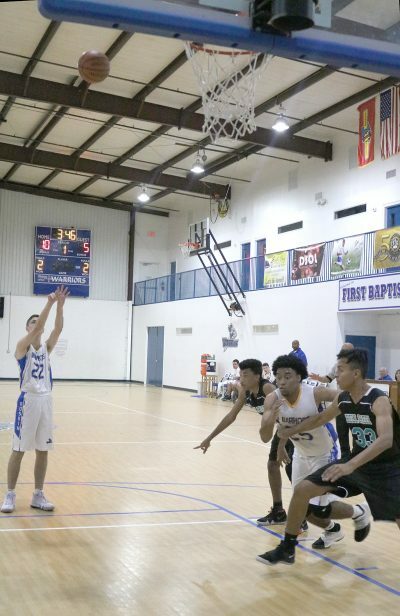 Grace Christian nipped RCS in Valrico 72-67 last Friday after a Warrior come-from-behind OT win over Bell Creek Academy on Jan. 10 and a rout of Calvary Lakeland 68-28 on Jan. 8. 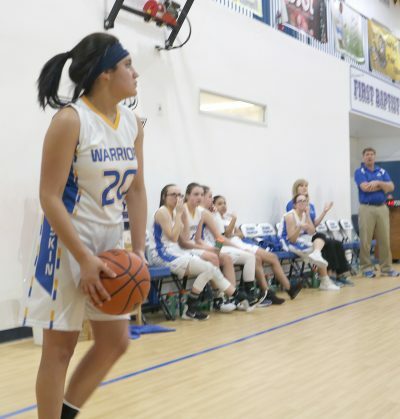 The Warriors gave Grace Christian all they could handle. Grace jumped out to a 15 point halftime lead on its homecourt, and RCS saw its 8 game winning streak come to an end. Coach Bonner’s guys showed tenacity by outscoring Grace 34-24 in the second half. The Warriors cut the early deficit to 2 points with a minute left in the game. 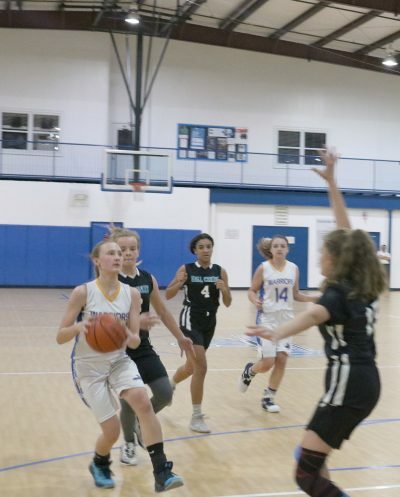 A late Grace 3-point shot sealed the win for the home team. The Warriors were led in scoring by junior guard Jesse Mobley with 18 points. Conner Kick and Caleb Statham chipped in 14 and 12 respectively. The night before at home, RCS came from 12 points back to defeat Bell Creek Academy 67-58. The Warriors were led by Mobley with 19, including 6 in overtime where the Warriors outscored Bell Creek 14-5. Junior Ant Jacobs contributed 17 points followed by Conner Kick with 11. Also scoring for RCS were Noah and Caleb Statham, each with 9 points, and senior Dylan Northrop added 2. Earlier in the week, RCS overwhelmed Calvary Lakeland. Warriors’ scoring was led by Caleb Statham with 18 and Conner Kick with 13. JV Boys beat New Path Academy 57-5. Warriors’ Jesse Mobley #24 goes up under the RCS goal in OT win over Bell Creek. Ruskin Christian School Anthony Jacobs #25 at left and Noah Stratham #22 at right. JV Boys beat Bell Creek 55-33. Varsity Girls beat Bell Creek 38-22. JH Boys lost to Grace 48-22. JV Girls beat Grace 22-20 in OT. JV Boys lost to Grace 59-33. Varsity Girls lost to Grace 50-13. Warriors’ Melanie Rodriquez #20 in action in the Bell Creek victory last week in front of RCS varsity girls coaches and bench. Ruskin Christian School Noah Stratham #22 puts up a free throw while Warriors’ Anthony Jacobs #25 jockeys for position in free throw lane.